Governor Paul LePage delivers his final State of the State address before a joint session of the Maine Legislature in Augusta on Tuesday night. 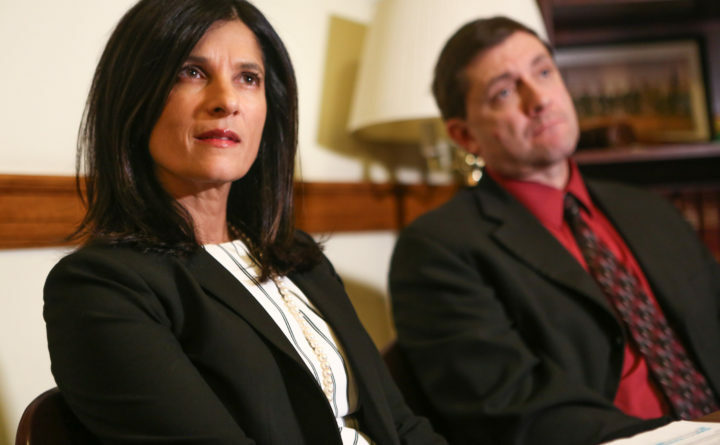 House Speaker Sara Gideon, D-Freeport, and Troy Jackson, D-Allagash, react to Governor Paul LePage's final State of the State address before a joint session of the Maine Legislature in Augusta on Tuesday night. 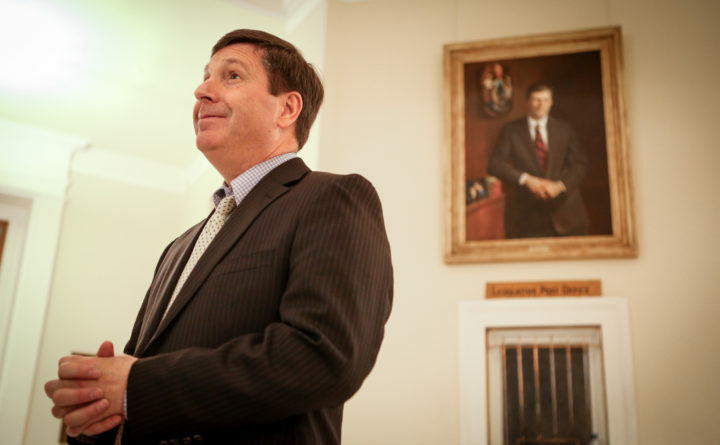 House Minority Leader Ken Fredette, R-Newport, speaks with reporters after Governor Paul LePage's final State of the State address before a joint session of the Maine Legislature in Augusta on Tuesday night. Unpredictable as ever in his final State of the State address Tuesday, Gov. 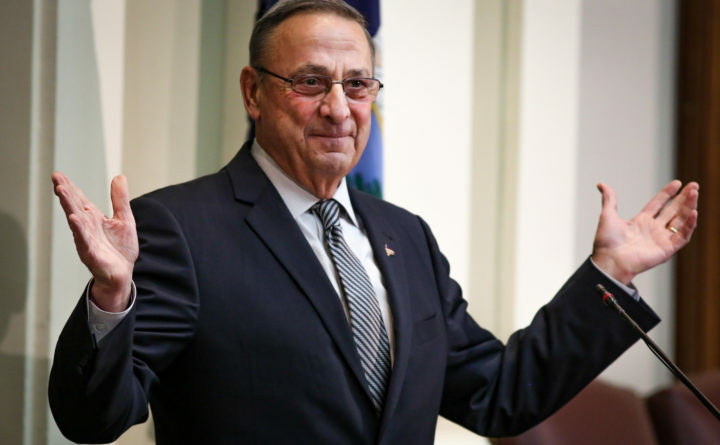 Paul LePage mixed barbs for opponents who have blocked some of his marquee policy initiatives with sometimes wistful reflections on his achievements. The 88-minute speech, which strayed considerably from his prepared remarks, veered from the usual fiery condemnation of his political foes to LePage justifying his governorship and ideology with stories about vulnerable Mainers who — from his perspective — had been failed by elected officials. 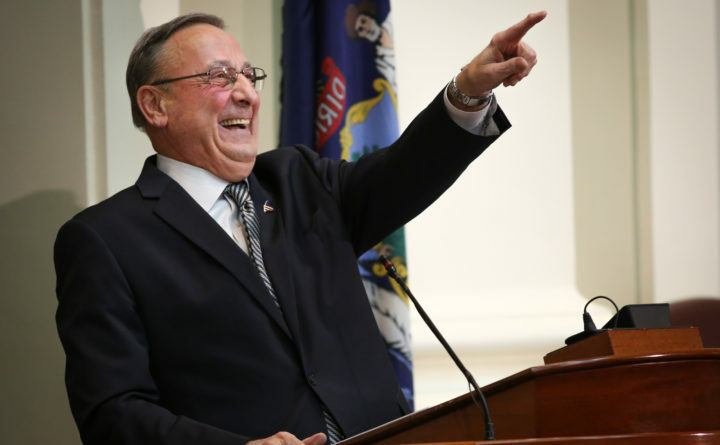 However, he did not hold back when it came to some of his regular targets, and the 2018 gubernatorial race to replace the term-limited LePage hung over his speech. “Unconscionable” was a word he used repeatedly as he tore through a litany of common themes, blaming the Legislature — mostly Democrats — for misplacing taxpayer resources and blocking what he believes would be the best path to prosperity, though later in the speech he praised individual lawmakers from both parties for their work with him. House Speaker Sara Gideon, D-Freeport, said through LePage’s tenure, lawmakers “have forgotten what it’s like to have government that’s functioning in Maine” and that the state “would actually be solving problems” with a more collaborative governor. “And I think the good news is that hopefully, in less than a year, we will be on the path to doing that again,” she said. 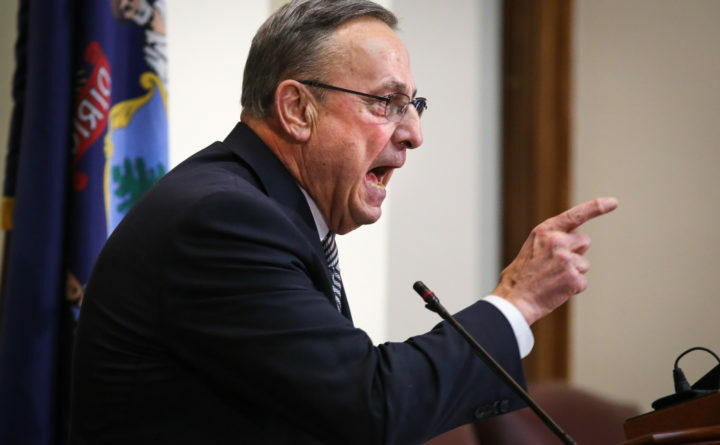 LePage triggered some gasps from lawmakers assembled in the House chamber when he said Maine should enact Medicaid expansion, which became the law following a 2017 referendum, before this November’s election. But he quickly shifted to “the bad news,” which isn’t news at all: He wants the Legislature to appropriate funding to do it without raising taxes, relying on gimmicks or touching the state’s accumulated savings — and only after clearing waitlists for services to elderly and disabled Mainers. “Appropriate the money so we can do it,” LePage said. Gideon bristled at LePage’s demands in comments to reporters following the speech. She has argued that there is enough money in the state’s Medicaid account to cover expansion costs until 2019. “When the Legislature needs to appropriate the funds, we will absolutely do that, but we’ll do it on our timetable,” Gideon said. The Legislature’s fiscal office and the Department of Health and Human Services disagree about how much expansion will cost and when appropriations will be needed. Proponents of expansion argue that the costs won’t be as high as the LePage administration claims — especially in the current fiscal year, which ends in five months — and that savings will be generated from fewer visits to hospital emergency rooms and people shifting from existing social service programs to Medicaid. LePage kicked off the speech with fighting words on a simmering topic that he’s promised to make his priority in 2018: conservation land that has been taken off property tax rolls. LePage said land in Maine that equals the size of Connecticut is in conservation, shifting more than $330 million to property tax payers. “You need to pay your taxes,” said LePage to boisterous applause from the Republicans in the room as Democrats sat mostly silent. LePage then shifted quickly to what he sees as the other side of the equation: that some of that revenue could and should be spent on social service programs for elderly and disabled Mainers. He passionately argued that his fiscal conservatism since taking office now allows him to direct government spending in ways that he described as more compassionate than Democrats. As he did in his 2017 State of the State speech, the governor highlighted an Albion couple whose home was seized over $4,000 in unpaid property taxes. LePage continued to use the plight of the couple, who are both older than 80, as an example of why his pending bill to protect people from foreclosure should be enacted. 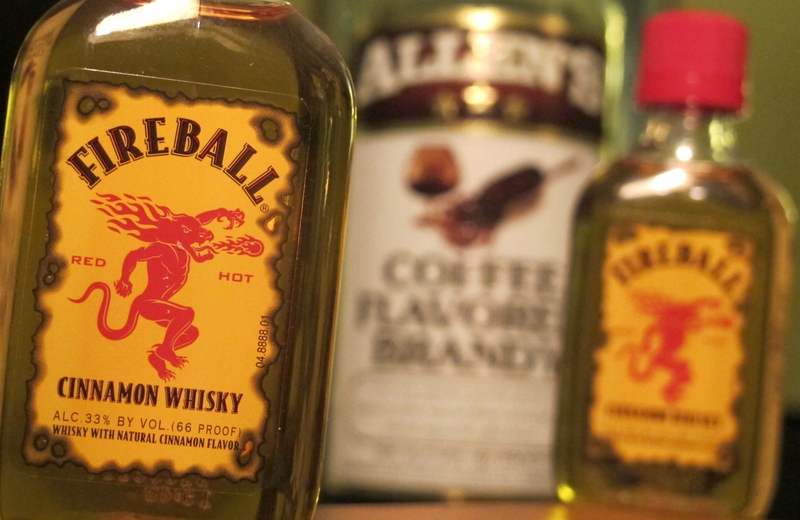 The bill faces opposition from the Maine Municipal Association and Maine Mayors’ Coalition. Echoing past concerns, LePage again called for the enactment of tougher rules in the citizen initiative process on the heels of recent successful ballot initiatives to raise the minimum wage, increase taxes on high earners, expand Medicaid eligibility, enact ranked-choice voting and legalize marijuana. He repeated a Republican call for stricter laws on geographic distribution in efforts to gather the required 61,123 signatures to force a ballot question, suggesting that the current standards favor progressives in southern Maine. Tuesday’s speech marked the seventh time LePage has delivered his annual address to a joint convention of the Senate and House — though in 2016 he declined to appear in person and delivered the speech in writing. As in past State of the State addresses, he devoted some time to advocating for lower energy prices and for so-called “right to work” legislation designed to weaken the political power of labor unions. He also repeated a call for lower taxes, this time through a proposal to better align Maine’s tax code with the sweeping federal tax changes enacted at the end of 2017. LePage wasn’t all fire and bluster. Notably, he thanked lawmakers from both parties for making decisions, such as building up the budget stabilization fund, which have put Maine on firm financial footing. “We are moving ahead,” he said.